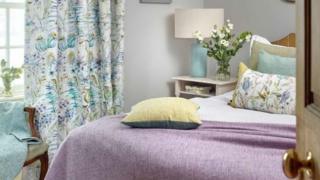 A Scottish fabric and furnishings firm has been bought out of administration, shortly after its collapse. Cambuslang-based Voyage Decoration, which employs about 50 staff, was sold to home decor group Ashley Wilde by administrators from KPMG. The administrators were appointed on Friday after Voyage got into financial difficulties. The new owners have yet to specify whether any jobs are at risk following the sale. It is understood that there are no plans to relocate Voyage from its current base in South Lanarkshire. Voyage, which has an annual turnover of £12m, designs, manufactures and distributes premium fabrics, soft furnishings and furniture. In a statement, KPMG said: "Its business model required it to hold significant levels of stock and recently the company found itself unable to secure sufficient finance resulting in stock shortages and a fall in sales. "Despite this, its order book remains strong and its brand remains highly regarded." Joint administrator Blair Nimmo added: "We are delighted to have been able to successfully conclude a sale to Ashley Wilde, protecting jobs and allowing the business to go on to the next stage of its development." Ashley Wilde is based in Hertfordshire and specialises in furnishings, fabrics and home decor products.